Our purpose as a club is to provide information to educate and prepare students about the field of dentistry and various aspects of the dental profession. Through the club, we make contacts with professionals in the San Luis Obispo County area to create relationships and learn from people who are living our future. We offer resources for many students - whether they want to be a dentist, dental specialist, assistant, dental hygienist, etc. We also work as a support group to help each other get into dental school with as much ease as possible. We hold manual dexterity workshops, visit dental schools, bring in guest dental speakers & admissions representatives, and give basic information on what classes to take and how to prepare for dental school. Our club was founded in 1999 by a student who is now a practicing dentist in San Luis Obispo County! Please email PreDental@calpoly.edu for updated meeting times and locations. AMSA is a pre-health professions society for students planning careers in health care fields. The American Medical Student Association is a pre-health professions society for students planning careers in health care fields. The club offers speakers from various health fields, assists in planning undergraduate study, provides an opportunity to get to know faculty, provides community service opportunities, and offers networking between fellow students with similar interests and goals. AMSA is a chance to begin preparing now for your work in the health care field. Please email calpolyamsa@calpoly.edu for updated meeting times and locations and follow the Facebook page for more information. Contact the advisor: Our faculty advisor is Cameron Shields, and she can be reached at cshields@calpoly.edu or at her CP phone number, which is 756-2906.
have a B average or above overall or in their biology courses. 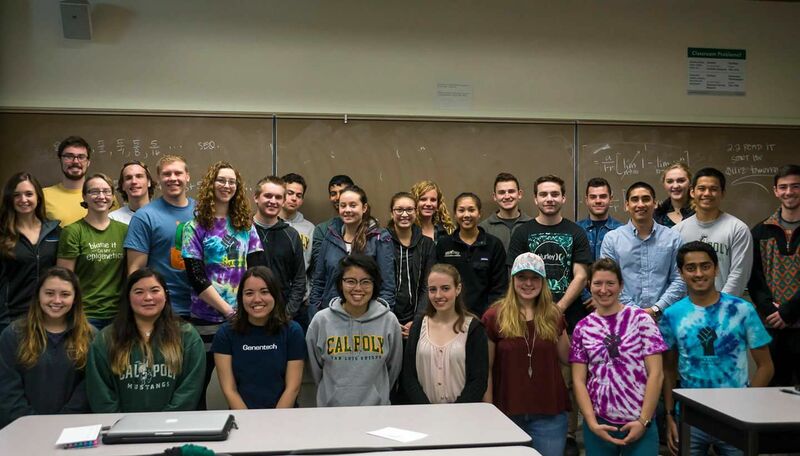 Join us every other week (starting the second week of the quarter) in Fisher Science (33) room 289 at 11:10 a.m. To join Tri Beta, just send us an email at cptribeta@gmail.com, or visit our Facebook page at https://www.facebook.com/CalPolyTriBeta for additional information. The cost is $35 for an associate membership, $45 for a regular membership, and $10 to be promoted from associate to regular membership. These are one-time fees resulting in a lifetime membership. All members receive a card and a certificate recognizing their membership. Regular members receive a Tri Beta key chain and honor chord for when they graduate. The Biotechnology Club educates members about the wide application of biotechnology in industrial, medical, and agricultural fields. Club activities consist mostly of listening to guest speakers from the biotechnology industry and getting hands-on experience by touring their facilities. During the academic year, we meet for one hour every other Thursday at 11:10 a.m. (University Union hour) in Building 33 Room 287. Club members are also involved in the Biology Department tutoring that is under the direction of Tri-Beta. Throughout the school year, the club organizes trips to biotechnology companies. Past tours include Microbiology Lab at French Hospital, Baileyana Winery, MedImmune, Promega, and Santa Cruz Biotechnology. Future tours include Genentech, Baxter, and Central Coast Pathology. Wildlife Club members share an interest and concern for the environment. Activities are geared toward developing a realistic approach to solving problems involving animals and their habitats. The Wildlife Club coordinates hikes and trips and informs people of volunteer and outreach programs to expand their environmental connections. The club is a source of knowledge and resources and aims to help members expand their interests and educational goals.